I went to Edinburgh with the idea of spontaneity in mind. One of the things I did without prior plans was go to Edinburgh Castle. Which is indeed a must see of Edinburgh. Situated at the top of the Royal Mile on Castle Rock in the old town of Edinburgh the castle is the focal point of the city and is a breathtaking center point for all to see. It was first built around 1130 atop Castle Rock, a volcanic formation that had been there since about 340 million BC. It was home to many Scottish monarchs. Perhaps the most known to all of us is Mary Queen of Scots who there gave birth to her son James in 1566 who would later become King James I of England. 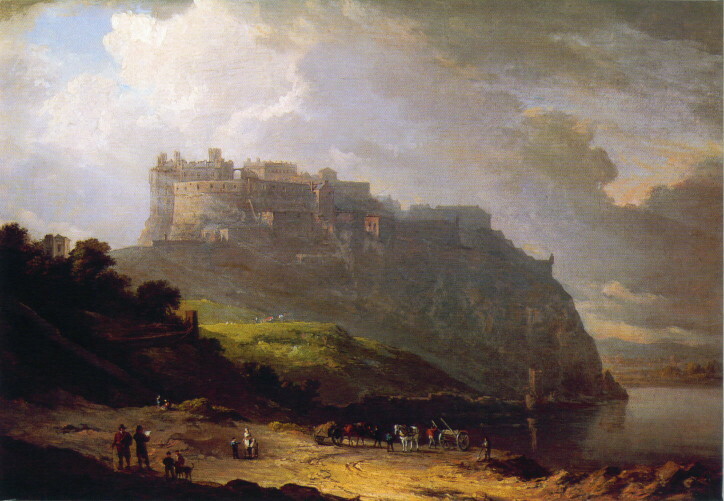 The castle was a fortress to block out all that caused Edinburgh harm. Nor Loch which was a man made lake lined the front of the fortress as a defense mechanism. 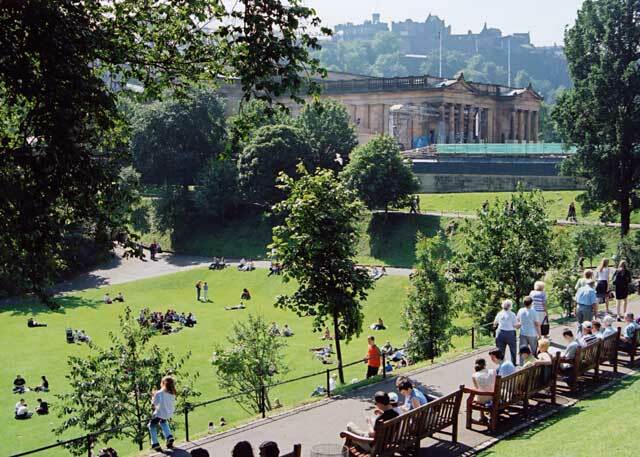 But once the loch was no longer needed it was drained in the 18th century and became Princes Street Gardens. A long and beautiful park the lines the street that it is named for. View of the park, pictured in back in the National Gallery, one of the many things built at the bottom of the drained loch. Google Images. 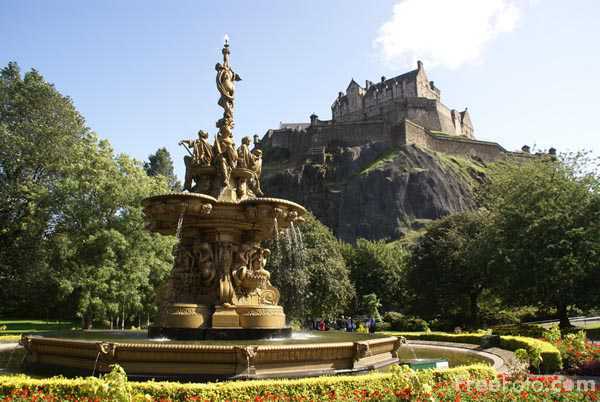 A view upwards at the Castle with Ross Fountain in the foreground. Google Images. On my day trip to the Highlands (you'll read about tomorrow) the driver told us that when Nor Loch was drained hundreds of dead bodies were found there. Results of the Plague and the cruel witch trials that lie in Edinburgh's past. I was forced to tour Edinburgh Castle on a chilly and rainy day, but I didn't let this slow me down. I didn't actually have proper rain gear but I enjoyed my visit none the less. There was an fog in the air that added to the castle's dark and mysterious allure. It was my first journey into a historic castle, one thing that I was then able to cross off my life list. There were many buildings on the grounds to discover. Including St. Margaret's Chapel, the oldest building in Edinburgh. I had to walk in the rain from place to place excited to get to the next one not only to have shelter from the rain but to learn what there was to learn there. The castle can be seen dominating the skyline from Arthur's Seat, which I climbed.